I was flipping through Ellie Krieger‘s latest cookbook when Samantha caught sight of the Oven-Fried Shrimp recipe and requested that I make it. I usually only get requests for muffins and dessert, so I was happy to oblige. The picture in the cookbook showed the shrimp dipped into a gorgeous green dressing, which Samantha made a face at. I decided to make the avocado dipping sauce anyway, and it was fantastic — the best part of the meal. I will use the leftover sauce as a salad dressing and on sandwiches. The shrimp were crispy and tasted great, but breading food is a lot of work in my opinion. This opinion probably stems from the fact that I love shrimp that are cooked simply in a little olive oil, wine, and garlic — no breading needed. In hindsight I would make the bread crumbs and dipping sauce ahead of time. But I knew the kids would like these as a change, so it was worth trying something new. When we sat down to dinner, I really talked up the green dipping sauce — told Samantha all about the parsley and the lemon, two things she likes. Didn’t mention the avocado. It wasn’t until I said it was called “Green Goddess Sauce” that she got excited and said it was “sooo good”. She ate most of it, and even convinced her little sister to give it a try. Perhaps I should start renaming the rest of the green foods that appear at our dinner table. These recipes are adapted from Ellie Krieger’s Comfort Food Fix cookbook — I did make a few changes along the way. To make bread crumbs: Pulse 3-4 slices of whole-wheat sandwich bread in a food processor. Toast in the oven at 350 F for 10 minutes (until lighted browned). Allow to cool. Preheat the oven to 425 F. Spray a baking sheet with cooking spray. Place the flour on a plate. Beat the egg whites in a shallow bowl. On another plate, combine bread crumbs, thyme, lemon zest, salt, and cayenne. Rinse shrimp and pat dry with paper towels. Dip the shrimp into the flour, shaking off any excess. Then dip the shrimp into the egg whites, and coat with the bread crumbs. 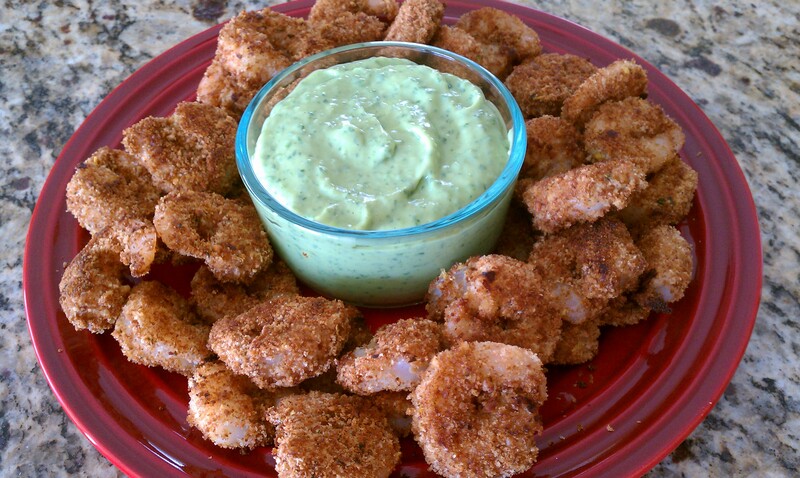 Set the breaded shrimp onto a large plate. When all the shrimp are breaded, place the prepared baking sheet into the oven to preheat for 3 minutes. Remove the tray from the oven and place the breaded shrimp on it. Spray the tops of the shrimp with cooking spray. Bake 10 minutes, flipping once halfway through, until crispy outside and cooked through (cooking time may be longer for extra-large shrimp). Place all ingredients in the small bowl of a food processor and process until smooth.